Looking for a classic girly girl design? You found it! It has everything that should please the girly girl. 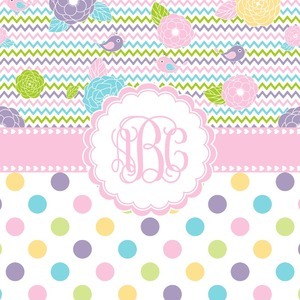 It has chevron, polka dots, flowers & birds along with an interlocking monogram and all done up in gorgeous pastel colors. We had a request to recolor our fall flowers and this is what it looks like in pastels. We used our 5 color polka dots for the bottom half, added our hearts ribbon and scalloped label with our interlocking monogram; and we used the swirls and flowers for our coordinating design; we think we ended up with the sweetest girly girl design.